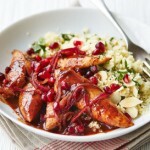 Spicy pomegranate chicken has been done in more ways than a bad sitcom or a Hallmark movie. It’s just a great basis for experimentation. 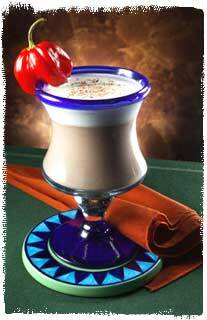 It originated in the Middle East and different versions of it abound. This one is from our Pomegranate Passion story at our sister site, where you’ll find more ideas to play with pomegranate and spicy. Rinse the chicken and divide it into four pieces. Flatten the breasts by covering them with plastic wrap and pounding until they are about 1/2 an inch thick. Chop the walnuts finely and combine with the flour in a shallow dish, like a pie plate. Put the eggs into a separate dish. Salt and pepper the chicken breasts, then dip each piece into the beaten egg. Immediately dredge in the walnut/flour mixture, pressing the coating onto the chicken. Heat the oil in a skillet. Add the onion and sauté until golden. Remove the cooked onions and set aside. Add the chicken and brown on both sides, about 10 to 15 minutes or until the chicken is cooked through. Remove the chicken and keep it warm. Do not wash the skillet. Add the chicken stock and pomegranate juice to the skillet, along with the cooked onion, currants and cayenne pepper. Cook over medium heat for about 5 minutes, then add the mint and cornstarch. When the sauce has thickened slightly, taste and adjust the seasonings. Pour over the chicken breasts and serve with a side of couscous and cucumber/yogurt salad.